For users who need to create audits or follow-ups on large volumes of keywords, it is completely possible to import them in large quantities via a .csv file. We will look at the example of an import of keywords in the SEO Tracking tool, but the process is the same for the Audit tool. When you click “Create a campaign”, you have the option to add your keywords via the “Simple Project” tab. Here, there is no import file; you directly enter the expressions to be followed in the cartridge. It’s fast but inconvenient if you have to enter 10,000 keywords and in addition you want to split the list into several themes. Now let’s see what happens next in the tab “Import Csv”. As the name implies, it is here that you will be able to import via a file all the expressions to be followed in your new follow-up campaign. Important note: it is quite possible to follow the same keyword on several engines, terminals, and different locations. To do this, it will be necessary to multiply the number of lines depending on the different tracking configuration of the same keyword. For example: tracking the keyword “iphone 7” on computer and mobile = two lines in the file. Aline with “computer” entered in Column F and another line with “mobile” completed in Column F.
Once your list of keywords is complete, save as .csv and UTF-8. Then click on the “Upload a csv” button to upload your keyword file. This action starts the project creation and the follow-up of the imported keywords. … and in an existing campaign? From here on, the sequence of actions is the same as explained above. Does importing a keyword file into a current project overwrite all of the keywords / existing groups? What happens if I import existing keywords into my campaign? What happens if I import existing keywords into another group? It is possible to enter the same keyword in different groups of a campaign, without this one being debited 2 times in your pool of keywords. 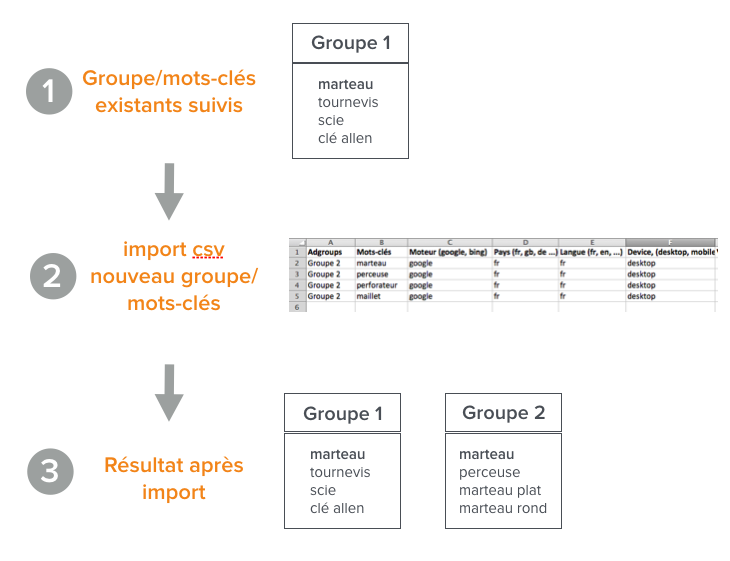 So if you are already tracking a keyword in a group and if you import the same keyword into a new group, the keyword will simply appear in both groups and will be counted as one consumed keyword. Migration or redesign a website, why use an SEO rank tracking tool?